SAN ANTONIO (AP) — Gov. Rick Perry was a champion of fiercely conservative social activism long before the tea party was born. He oversaw the "Texas Miracle" job-creation boom and became the state's most powerful governor since Reconstruction. But nationally, Perry is better known for his 'oops' presidential debate brain freeze or for not opposing forcefully enough the notion that Texas could secede from the union. For many outside the Lone Star State, he's a political punchline on par with Dan Quayle — if he's known at all. Now, the longest-serving governor in Texas history is quitting his day job. Perry announced Monday that he won't seek a fourth full term in office next year, but notably didn't say whether another run for the White House in 2016 could be next. "The time has come to pass on the mantle of leadership. Today I'm announcing I will not seek re-election as governor of Texas," Perry said Monday. "I will spend the next 18 months working to create more jobs, opportunity and innovation. I will actively lead this great state. And I'll also pray and reflect and work to determine my own future." But for that future to include another run for president, Perry will first need to concentrate on rebuilding his tattered image outside of Texas. Perry had never lost an election during his 27-year political career when he strapped on his signature cowboy boots and strode into the race for the GOP presidential nomination in August 2011, becoming a near-instant front-runner. Perry, who took office when then-Gov. George W. Bush left for the White House in December 2000, set the tone for his tenure the following June — vetoing more than 80 bills in what became known in Austin as the "Father's Day Massacre." Since then, he's vetoed scores of other would-be laws, including a $35 billion public education budget and a ban on executing mentally disabled inmates. But most of Perry's power has come from his sheer longevity. He remained in office long enough to tap loyalists — sometimes even his top donors — to every major appointed post statewide. "He's made the state into his personal fiefdom," said Matt Glazer, a Democratic consultant. Still, Gidley and others note Perry has been successful at appearing regularly on national television, attracting a great deal of media attention in his recent job-poaching tours of California, Illinois and New York. The governor said Monday he is "looking forward to the next 18 months as I serve out my term. Any future considerations I will announce in due time and I will arrive at that decision appropriately. But my focus will remain on Texas." Longtime staffer and former presidential campaign spokesman Ray Sullivan attended Monday's event and said afterward that Perry would have more opportunity to prepare for a presidential run. "Without the pressure of another campaign, a governor's campaign and without the pressure of another legislative session, there's a lot more opportunity to make those trips, to have those opportunities," he said. Sullivan said of Perry's legacy: "He has held the line on government. He has created an economic engine that is the envy of the nation and has really stuck to his conservative principles and been successful doing so." 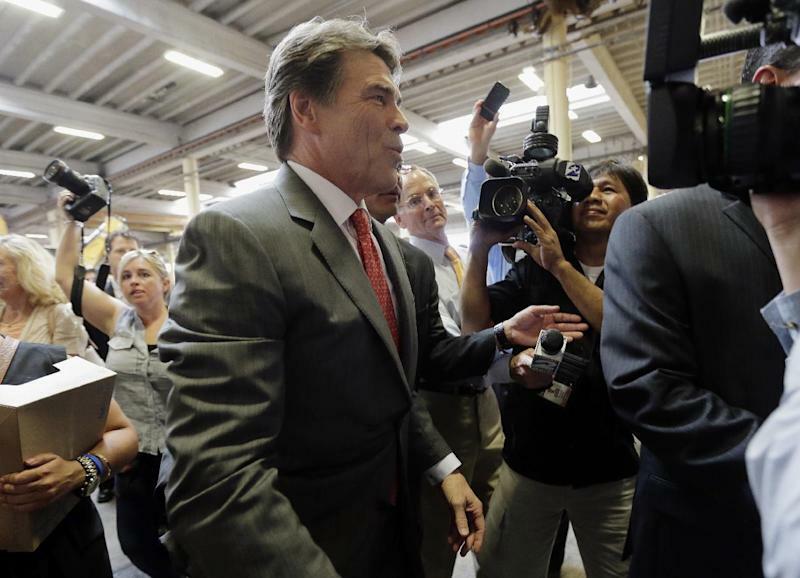 Perry's decision opens up the field to a wide swath of gubernatorial contenders. Texas Attorney General Greg Abbott is expected to seek the governorship and becomes the immediate front-runner. Spokesman Matt Hirsch said Monday that Abbott will announce his plans soon, and Abbott has said he plans to travel to many cities across the state. An Eagle Scout, Perry urged the Boy Scouts not to accept openly gay youngsters. And the avid defender of gun rights once produced a laser-sighted pistol from his running shorts and shot a coyote while jogging in rural Austin. Over the past decade, Texas has created a third of the net new jobs nationwide, though critics note Texas has a disproportionate percentage of hourly workers earning minimum wage or even less, according to federal employment data. Perry also credits the state's relaxed regulatory climate and limits on civil lawsuits for job creation, though some have pointed to the consequences of little oversight, noting the West fertilizer plant explosion in April that killed 15 people was lightly regulated and even firefighters were unaware of the highly combustible chemicals inside. Perry detractors also note that the governor opposes expanding Medicaid coverage in Texas — a centerpiece of the White House's health care reform — even though Texas has the highest rate of uninsured residents in the country. It didn't look so far-fetched last week, however, when Democratic state Sen. Wendy Davis was on her feet for 12-plus hours as Democrats used the filibuster to help block sweeping new restrictions on abortion in Texas. She became a national political sensation, prompting many supporters to urge her to run for governor. Perry's response was swift, immediately calling lawmakers back for an extra special session. He said he was confident they'd approve the law in record time.